I had previously given a different piece this title, but decided this painting lent itself more to it. The blonde woman with her back to the black haired Amy. The previous painting (see recent Blogs) is now to be called ‘You Know I’m No Good’ which is the work with Amy wearing Union Jack wings. Both these artworks and three others will be on show along with recent paintings from Bristol at Roy’s People Art Fair in London to be held from 1-4 November. The exhibition is at Bargehouse, OXO Tower Wharf and I will be there for the duration. Please come along and introduce yourself to me as I welcome meeting people and talking about my work. I decided to paint a small series of works for the Art Fair based around Amy Winehouse, one of my heroines. In this work, the very modern woman of our times is so busy on her smartphone she is completely oblivious to her surroundings and the stunning street art behind her. 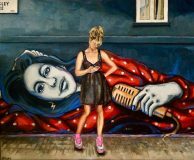 This particular street art is in Camden, Amy’s stomping ground and I knew I had to feature it in my own composition. If you would like to be kept up to date with what I am doing in the next few months please sign up for my Newsletter at the top of the Home page. I am also on Twitter, Instagram and have a Facebook page called Miche Artist. Feel free to email me as well at michetoots@yahoo.co.uk.